People leave stupid comments on blogs. Not every comment is stupid, but there are enough obnoxious ones for me to have an indentation in my desktop that perfectly matches my forehead. 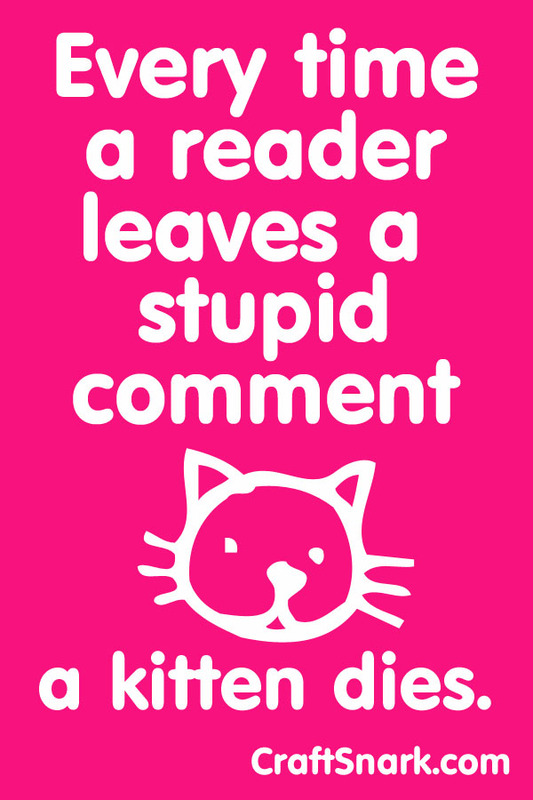 Every time you leave a stupid comment, a kitten dies. This is a serious issue. At this rate, cats will become extinct by Tuesday. This is dire. It means the end of inspirational kitty posters, and tagging Instagram photos with #caturday. It means no more grumpy cat. It also means no more hairball vomit or filthy litterboxes... but we won't talk about that. Instead we'll think about the empty hole left in our heart, and our laps, as these obnoxious comments fell kittens in slash-and-burn dekittenation. Since cuteness is at premium these days, I know you want to be part of the solution, not the problem. Here are a few of the stupidest comments out there. Feel free to add to this list in the comments. Asking a question that was already answered in the post. If the post says "I used product X, but you can substitute it with whatever you have on hand," don't ask "can I substitute what I have on hand for product X?" Asking a question that was already asked 5 comments ago. And answered 4 comments ago. And asked again 3 comments ago, and answered again 2 comments ago. Asking a question that has nothing to do with the post. Think of the kittens, then find a more appropriate place for your question. Wanting to know where to buy supplies - when supply links have already been added into the post. Those links were for everyone else. We have special links for you, right? Commenting on the unsuitability of the craft. If a project is truly dangerous, you'll be tempted to point it out. But letting me know about the toxins in my food coloring, the danger of sniffing glue (when I've already mentioned using the product outdoors), or not letting children handle the hot glue gun is killing fluffy white kittens with blue eyes and perfect little paws. Cut it out. What kitten-killing comments have you seen around the internets? I think you've pretty much covered the major ones.